If you are considering a new carpet, you will be astounded when you discover the range of styles, qualities and practical characteristics available to you today. With the advent of waterproof and even bleachproof carpets, you are no longer restricted by old fashioned concerns over pale colours and spillages. We even supply a completely ‘Green’ carpet, made from recyled plastic bottles!! 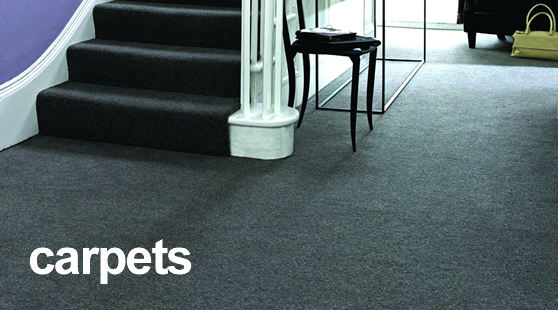 All carpet quotes from Chapel Flooring are fully inclusive. There are no surprises waiting on your final invoice for fitting, underlay, grippers or door bars. Unlike some carpet companies, we do not supply substandard products such as paper underlay which would compromise the finish and durability of your carpet. We consistently use top quality underlay for every carpet we sell, regardless of its price. We stock the widest range of styles and weaves from leading manufacturers including Brintons, Ryalux, Crucial Trading, Brockway, Adam, Axminster, Wilton, Goodacre, Heuga and many more. You are welcome to borrow as many carpet samples as you wish, to try at home, free of charge! We cater for the hardwearing business requirements through to the comfort of the home environment. Take a look at our showroom and open your eyes to the huge array of weaves, twists, naturals, colours, patterns and component materials. Regardless of how luxurious or restrictive your budget appears, we cater for everyone – from traditional to modern.